Anthony Cunnigham and his Galway players after last Sunday's game. THEY HUDDLED IN a group on the Croke Park pitch afterwards last Sunday afternoon with their manager Anthony Cunningham in the centre issuing sharp instructions. The message was clear. These Galway players may have claimed the most remarkable championship scalp of their careers but that success now had to be parked. In his post-match interview Cunningham spoke of the need to develop consistency and how this could not represent an end but must be the beginning. Perhaps that was the most impressive aspect of the Galway hurlers performance last Sunday. Eight years ago on the day that Peter Barry was blocked down, that Michael Jacob swivelled and struck to the net, and that Brian Cody was left thumping the ground, Wexford celebrated in riotous fashion. They had fashioned a marvellous smash and grab effort in their Leinster semi-final and who could blame them as their supporters deliriously engulfed the players after the game? Pitch invasions may now be outlawed yet there was still a temptation for Galway to get lost in the moment last Sunday. Toppling Kilkenny in Leinster is a rare feat that demands to be savoured. But there was a notable restrain to their celebrations, defined by the fact that team selector Mattie Kenny put the players through their warm down and that Cunningham insisted on addressing them before they left the pitch. For any Galway supporters daring to dream that this could be the start of something magical, there were encouraging signs. As a hurling county, they have been schooled relentlessly on false dawns. The potential that existed west of the Shannon has been graphically illustrated by the four All-Ireland minor titles, three All-Ireland U21 crowns and four All-Ireland senior club wins that have been achieved over the past eight years. Yet none of that has translated into something tangible at senior level. Three of the men that stood in the group listening intently to Cunningham last Sunday as the stands emptied their 22,171 inhabitants, have been here before. In 2005, David Collins, Tony Og Regan and Damien Hayes were members of a Galway team that won a nine-goal thriller against Kilkenny. Rather than that the All-Ireland semi-final be the precursor to a trophy-laden era, it merely spawned further spells of frustration. It had been seven long weary years before that trio experienced the sensation of a senior championship win over Kilkenny again. And they have compiled enough hurling experience to warn their younger teammates of the dangers of thinking too far ahead. There is a sense their manager will not let them do that. If there is one trait evident in Anthony Cunningham’s managerial career, it is that the Kilchreest native is constantly thirsty for success. When he won St Brigid’s first Roscommon senior football title in eight years in 2005, he followed that up by completing a three-in-a-row and winning the Connacht club crown in 2006 for good measure. 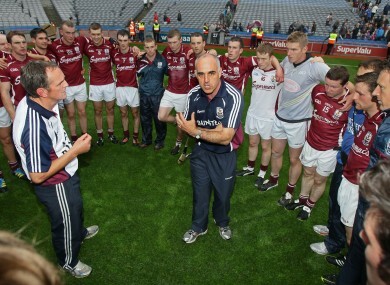 It was the lure of another football three-in-a-row with Westmeath outfit Garrycastle that convinced him to stay on in charge again for their 2011 campaign and after managing that feat last autumn, they progressed to lift the Leinster title in December and took Crossmaglen to a replay in the recent All-Ireland club final. And even after suffering a shellacking against Tipperary in the 2010 All-Ireland U21 final and being the victims of an unseemly mess involving the venue for that game, Cunningham stayed calm and bounced back last September to steer his team to lift the All-Ireland title in that grade. He will be urging his players to be patient now and get back to working on what got them to this point. And yet now there have been frissons of excitement generated for the future of their year, just as there have been for the game as a whole. There had been fears expressed in recent times that Kilkenny’s awesome dominance was set to prove damaging to hurling. It was a spurious argument in ways, similar to the one expressed during Euro 2012 that the stranglehold Spain were exerting on football was boring and draining competitiveness out of the sport. Great champions like Kilkenny and Spain have to be admired for the high standards they set and attain on a regular basis. And it is precisely because they are so great, that when they are defeated it is such a seismic result. The fact that Kilkenny have been overturned in mid-summer has breathed renewed life and enthusiasm into the rest of the hurling campaign. As Tomas Mulcahy put it on The Sunday Game after Sunday’s match, ‘Now we have a championship’. He is right and it was something that hurling needed. Three enjoyable and engaging Munster hurling championship games could not mask some of the dispiriting aspects of this season’s action to date, the demise of Dublin, the collapse of Antrim and the weakness of Laois. There have been too many lopsided encounters and with all the portents suggesting another Kilkenny All-Ireland title was on the way, interest was starting to wane. Then again maybe in a sport where 89 of it’s 124 titles have been carved up by three teams, it is churlish to be hoping for novelty. And given Kilkenny’s stature, the players they have to come back from injury, the backlash that will now ensue, the hunger this loss will generate and the fact that a backdoor All-Ireland is the only absentee from Brian Cody’s hurling CV, it is clearly feasible that James Stephens man Eoin Larkin could be raising the Liam McCarthy trophy in September. But at least Galway’s victory has thrown some uncertainty into the equation and will have given hope to a host of counties. That’s something to be thankful for. With attendances forecast to be down almost 33% and the subsequent hit that means financial coffers will take, it is entirely predictable that calls for the Munster senior football championship to return to a seeded format will ensue over the coming weeks and months. Money speaks loudest of all and certainly the absence of a Cork Kerry final from the calendar is a financial blow to the provincial body. That thought will weigh heavy on their minds. But they must seek to strike a balance as the flipside will be the potentially ruinous effects on developing the game in other counties. Much like it was a privilege to watch Limerick’s John Galvin step up and dominate Munster final days of late, it was heartening to see one of the most under-rated midfielders in the country, Clare’s Gary Brennan, rise to the occasion last Sunday and give Cork plenty to think about. And on an afternoon that provided yet another reminder of Tipperary’s developing football pedigree as they claimed their second successive Munster minor crown, there was a sense that this issue needs closer attention rather than a kneejerk reaction. Email “Wednesday Watch: The need for Galway patience and the football format down south”. Feedback on “Wednesday Watch: The need for Galway patience and the football format down south”.